On December 17, 2015, The Gillette Company, part of Proctor & Gamble (Proctor) sued the Dollar Shave Club (DSC) for patent infringement. If you use DSC’s razors, according to Proctor, you’re infringing. Each morning you’re committing a steamy tort in the bathroom. Patent infringement is not uncommon, however. If you check your phone before that shower, you’re infringing dozens of patents, and possibly other intellectual property rights too. This is a struggle between a $210 billion multi-national bludgeoning a 190-employee Netflix-copy ($152 million revenue in 2016 and 3.2 million members). Proctor has 105,000 employees and $65 billion net sales in 2016. According to its amended complaint, it spent 125 years perfecting the safety razor, supplying doughboys, developing the first women’s razor, razor dispenser, stainless steel blades, double-bladed razor, razor with a lubricating strip, and razor with three progressively-aligned blades. Gillette’s razors are used by over 750 million people in every state and 200 countries. But Dollar Shave Club launched in 2012 with a Youtube upload of a radio-flyer riding smarmy CEO (Michael Dubin) talking up his blades like they were skateboard rails. It resembles a teenage clique, but with 3 million members. The adults have taken notice. 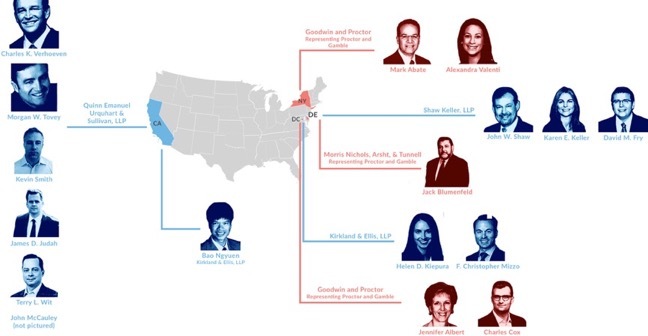 Suit could have been filed anywhere because DSC ships everywhere, and Proctor has so many offices, it could create a model UN with its world-wide roster of lawyers. In this case, Proctor chose patent-savvy Delaware. It started with a simple, seven page complaint between Proctor and DSC filed in December 2015. 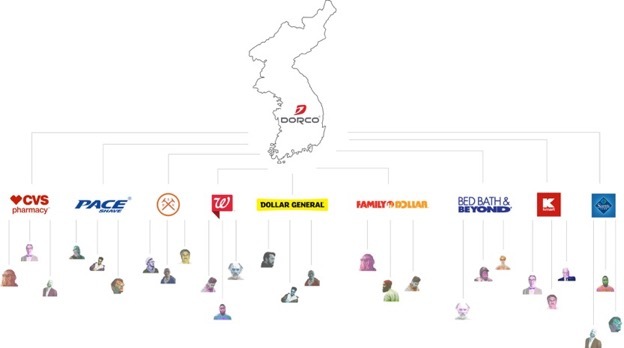 Eleven months later, Proctor added two co-defendants, California company Pace Shave, Inc., one of many distributors of the third co-defendant, Dorco Company, Ltd., a Korean supplier alleged to be supplying, well, a lot of distributors. See below. Proctor elected not to risk alienating the other distributors down the chain, which distribute other Proctor products. Thus, Pace Shave, Inc. is the distributor left behind by the herd. 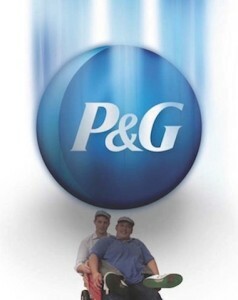 Proctor enlisted Jack Blumenfeld, of Morris Nichols, Arsht, & Tunnell, a Yale grad listed by IAM 250 (2011) as “Number One Delaware Patent Litigator.” Goodwin and Procter, LLP is on the Proctor and Gamble side as well, specifically Mark Abate, Alexandra Valenti, from Goodwin’s NY office, and Jennifer Albert and Charles Cox from its DC office. In DSC’s corner is Shaw Keller, LLP in Delaware, and the San Francisco office of Quinn Emanual Urquhart & Sullivan, LLP, captained by Charles Verhoeven who received Managing IP’s “Outstanding IP Practitioner” (2012). Better shaves. That was the technological goal, and Proctor’s Massachusetts R&D team of scientists, headed by Colin Clipstone, who already endured ugly legal warfare against Schick which Proctor’s claimed copied its patented blade configuration. To infringe, all elements must be present in the accused device. So like in many patent fights, the definition of the invention’s elements is pivotal. Either the accused product has the element as defined, or it doesn’t. Proctor does not believe the underlined terms need a special definition. Defendants disagree. 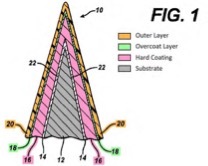 How the judge interprets the blade’s three coating layers could end the case. If the judge defines a term such that a reasonable jury must find for one side or the other, game over. The blades either have “amorphous material,” “carbon containing material, doped with another element,” and/or “overcoat layer of a chromium containing layer” or it doesn’t. Typically defendants will try to narrow the claim construction so that their blades are outside the definitions. Hence, the apparent effort by Dollar Shave Club to complicate the terms, making them more narrow. Plaintiff resists such narrowing to push the accused products within the definitions (see an example below). Both parties point to various statements made during the patent’s prosecution to try to justify their definitions. Neither Proctor nor defendants here venture outside the patent file itself. Which definitions above would be easier meet when facing a jury? In December, 2016, Defendant Dorco filed a petition before the newly-created Patent Trial and Appeals Board for inter partes review of the patent, hoping to invalidate it in one thrust. The procedure results in a majority of patents getting at least partially invalidated, which may be why there is a pending Constitutional challenge to the procedure’s validity under the 7th Amendment right to a jury. Meanwhile in its petition, Dorco says the coating technology was obvious, citing various references spanning decades. Proctor argues against a new review, claiming the references were already considered by the patent office. Although the burden of proof in the Patent Trial and Appeals Board to invalidate is a lower, “preponderance of the evidence” standard, as opposed to the higher, “clear and convincing” standard in federal court, Dorco’s petition was denied. Trial is set for May 14, 2018. If Dollar Shave Club loses, I expect a five-cent price increase for my monthly supply.